Justin is not much of a talker, which bodes well for our relationship as I never shut up. I've watched him conduct meetings, host a radio show, and lately, he's been dodging arrows that he believes are being shot through our window. Its amusing and exhausting. Between Justin's performances, his snoring, and the kids, I don't think I've gotten a full night's sleep in years. Since I don't sleep much in our bedroom, I've decided that it should at least be pretty - so when I'm staring at the walls listening to the beast roar beside me, I've got a nice room to look at. I purchased an old armoire and spent a few days sanding and repainting it before I enlisted Justin and his father to haul it upstairs. Though I had measured the space in the room, I didn't account for getting it into the bedroom. 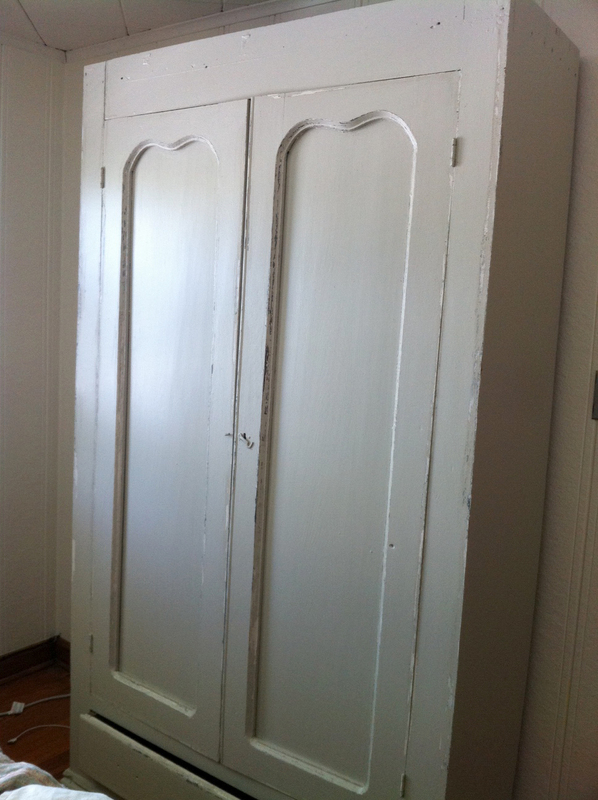 The armoire couldn't make the turn in the hallway - it was just too big. After a lot of time, a lot of discussion and many failed attempts, it was called a loss - it just wasn't going to fit. I was upset, but there was nothing to do done. That is until my brilliant father-in-law went home and fetched my kid's toy wooden blocks. He made a mock-up of the hallway/bedroom and worked out a plan to work my armoire into my bedroom. The next day, my armoire was nestled comfortably in the bedroom and I was filled with joy. Apparently, my husband was filled with rage. That night, I awoke to him shouting into his pillow. "Stupid armoire," he snarled. "It's not going with us when we move...Stupid heavy piece of junk." I usually ignore sleep-talking but this got my full attention. "Justin," I said. "Why are you talking about the armoire?" He turned his back to me, nuzzled down into pillow and said calmly, "Because...Tomorrow -I'm going to burn it."